Request a call Home / Blog / Do you have a fixed or a growth mindset? I’ve been thinking a lot lately about Carol Dweck’s Mindset: The New Psychology of Success, and what it teaches about the role of mindset in our embrace of the new, sometimes hard, and always unknown of transition. Those are the very conditions that often trigger a fixed-mindset in which it’s easy to feel challenged, threatened or confronted with something we don’t know how to do or don’t want to do. 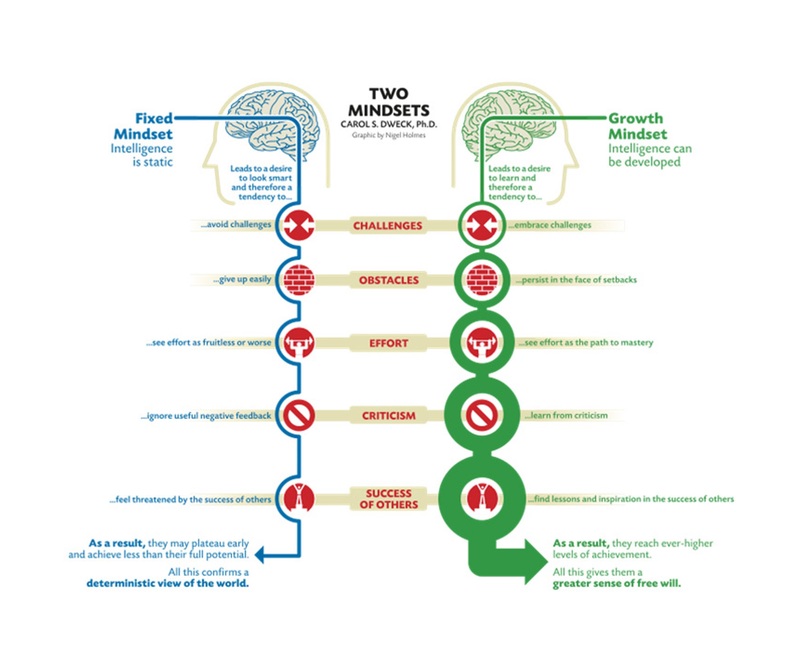 What I appreciate about Dr. Dweck’s research is that it makes clear that while some of us may have been born with more of a growth mindset than a fixed one, or vice versa, most of us draw on both and both serve a function. The key is to recognize, especially when the fixed mindset is limiting our progress, and to learn to remain in a growth mindset when most challenged or faced with set-backs. Instead of giving up we learn from it and make intentional decisions. I was reminded of this just today when I learned that I lost a competitive assignment. I could indulge this discomfort of rejection or focus on the future, learn what it means, and take action. What does that work really mean to me? What will it take to develop, apply myself and become a more successful competitor? Maybe I’ll decide I should apply myself in that direction or maybe to different kinds of assignments. Both outcomes are products of a growth mindset, as long as I’m open to the lessons it teaches. Different circumstances trigger a fixed-mindset for different people. As practitioners, we can help our clients come to recognize their triggers. We can use Dr. Dweck’s 4-step journey as a way to support our clients exploring what happens when they are triggered and how to learn to remain in a growth mind-set. It’s like core-strengthening for success. With awareness, recognition, and exercise, we have greater tools for embracing and thriving during stressful situations such as transitions. June is a great month to consider what tools, techniques and insights we can offer clients to support their growth while in transition. Read or reread Dr. Dweck’s book, learn about and remind ourselves how our mindset affects our success in transition.